Canadian Artists’ Representation/Le Front des artistes canadiens (CARFAC) is incorporated federally as a non-profit corporation that is the national voice of Canada’s professional visual artists. 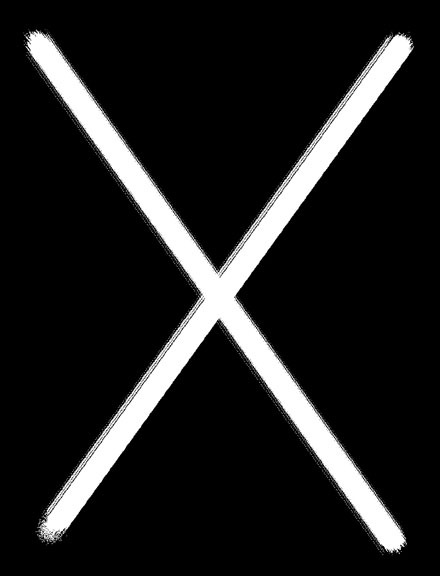 As a non-profit association and a National Art Service Organization, our mandate is to promote the visual arts in Canada, to promote a socio-economic climate that is conducive to the production of visual arts in Canada, and to conduct research and engage in public education for these purposes. 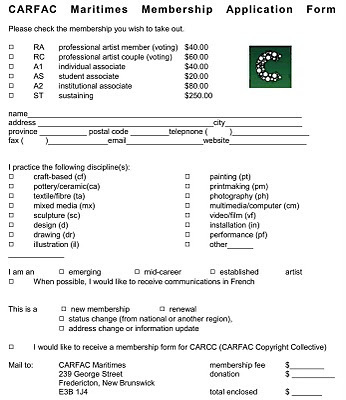 CARFAC was established by artists in 1968 and has been recognized by the Status of the Artist legislation. CARFAC is guided by an active Board, elected by the membership. We believe that artists, like professionals in other fields, should be paid for their work and share equitably in profits from their work. As the national voice of Canada’s professional visual artists, CARFAC defends artists’ economic and legal rights and educates the public on fair dealing with artists. In doing so, CARFAC promotes a socio-economic climate conducive to the production of visual arts. CARFAC engages actively in advocacy, lobbying, research and public education on behalf of artists in Canada. We appreciate your interest in CARFAC Maritimes and look forward to your continued support. 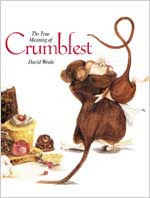 Antonia Francis reading The True Meaning of Crumbfest, written by David Weals; audio book published by Rattling Books. 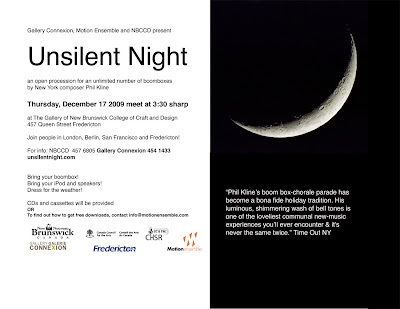 Clive Holden "Trains of Winnipeg"
Evalyn Parry "14 (for December 6)"
Lord Torvald Torgarson "Ragnarok almost Rolled"
Unless I get caught in the squeeze play of a presentation and two new books’ delivery by Midland from the printer, I intend to participate in Unsilent Night’s 2009 performance parade in downtown Fredericton. I walked in last year’s performance. This year, my post-fire purchased new portable CD+cassette player is on the living room desk with the necessary C-cell batteries. A beautiful, mobile piece of ambient public art, UNSILENT NIGHT can be compared to a holiday caroling party—except that participants don’t sing. Instead, each carries an ordinary boombox playing a separate cassette or CD that becomes part of the piece. Bring your iPod and speakers! 22 Nov 2009 Joe Blades interview with poet Catherine Owen. as if i don't have more than enough else on my plate/table i've started writing a promotional Broken Jaw Press blog to chat up the publications and the activities of our authors and artists. Andrea Gibson: "Wells to Fill", "Rush Hour", "See Through", & "The Moon Is A Kite"
Fredericton launch reading by Capítulo de Fredericton de la Academia Iberoamericana de Poesía for Poetic Voices Without Borders 2 (Gival Press) edited by Robert Girón and published in México in 2009. Fredericton launch reading by Capítulo de Fredericton de la Academia Iberoamericana de Poesía for Speaking desde las heridas, edited by Claire Joysmith and published in 2009 with the support of the National Autonomous University of Mexico, CISAN, Monterrey Tech & Whittier College.